Adolphe Rousseau is one of the most beautiful and very dark Peonies in the mid early section of the season. With beautiful double and a very deep maroon red, with yellow stamens among the flowers. Adolphe Rousseau has an excellent use for cut flower production as well for landscaping in gardens and city parks all over the world. The mature plant produces each year more and more flowers. 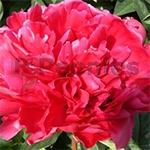 In Holland you will find the best conditions for growing Peonies, Pfingsterrosen or Pivoines. Dutch growers sell high quality Peony tubers to customers all over the world.